The first advertisement released by Bashar al-Assad during this year’s Syrian presidential election campaign was tagged with the slogan Sawa, or “Together.” It proved to be a misguided choice for a plebiscite marred by widespread ballot stuffing, choreographed pro-Assad celebrations outside the polling stations, and no votes cast by Syrians in rebel-held territories throughout the country. For the incumbent, who won an improbable 89 percent of the vote, the election was a way to demonstrate to friends and foes that he has the wherewithal to survive a civil war now in its third year, no matter the cost—which thus far includes some 190,000 deaths (a third of them civilians, according to the United Kingdom–based Syrian Observatory for Human Rights) and the devastation of much of the country’s economy and infrastructure. The “Together” ad was a slick piece of propaganda. In it, an idealized cross section of Syrian society—children mourning fathers killed in battle, bearded old farmers in straw hats and kaffiyehs, veiled women, construction workers and, strangely, people in white lab coats—floods into Krak des Chevaliers, a massive Crusader castle twenty-five miles west of Homs. (T.E. Lawrence called it “perhaps the best preserved and most wholly admirable castle in the world.”) Over triumphal music, Syrians ascend to the ramparts and erect a towering pole for an outsize Syrian flag, which flaps in the wind, backlit by the sun. One by one, they salute it. An aerial shot shows hundreds more people gathered outside the castle walls; the day is bright and everything is green. Perched on a precipice that commands the main route between the Mediterranean coastal mountains and inland Syria, Krak has long been a prized location. Syrian rebels held the castle and the surrounding village of al-Hosn until March of this year, when the Syrian army retook it. Shaky videos posted on YouTube show dark clouds and smoke erupting from the castle as mortars and bombs fall. The World Monuments Fund and UNESCO—Krak is a World Heritage Site—have raised alarms over photographs that show the castle walls pockmarked from shelling and a thirteenth-century Gothic loggia riddled with bullet holes and blackened by fire. But evidence of this damage cannot be gleaned from Assad’s agitprop. Krak looks to be unscathed and cleared of debris, and the ad ends with a cheery message, “Together, stronger,” followed by the president’s signature. Another “Together”-themed campaign ad features children sneaking out of their beds at night to repaint a wall outside their school by flashlight. As Assad propaganda goes, it’s especially cruel. Protests erupted in Syria in March 2011 after the arrest and torture of children in the southern city of Daraa for writing anti-government graffiti on their school walls, including a slogan they saw on television from Tunisia and Egypt: “The people want the fall of the regime!” More than three years on, much of Daraa is in ruins, including another iconic minaret, that of the Omari Mosque, one of the oldest in history, built in the seventh century during the Islamic conquest of Syria. Like Aleppo’s minaret, Daraa’s was destroyed in April 2013 during fighting between the rebels and government forces—targeted, activists said, by government tanks. An Ottoman yearbook published in 1900 recorded nearly 17,000 houses in the province of Damascus, of which half still remain, according to the estimates of architectural historians—or at least they did until a few years ago. “In all the eastern Mediterranean—from Egypt to Greece—the Syrian towns of Damascus and Aleppo are the only large cities which preserve domestic architecture on such a scale,” write the architectural historians Jakob Skovgaard-Petersen and Stefan Weber. “Other important cities, such as Cairo and Istanbul, have lost…most of their residential architecture and preserved only those buildings considered historical monuments,” like mosques, schools and a few faded palaces. Five years ago, in what seems like a different Syria, the Assad government wasn’t bombing architectural treasures into ruins; it was helping to preserve them amid a tourism boom centered in Damascus and Aleppo. Both places are ancient, among the world’s oldest continually inhabited cities, with a preserved historic fabric unique in the Middle East and the wider Islamic world. Damascus, in particular, with its cohesive urban core, unchanged for centuries—all archways, meandering alleyways and hidden courtyards—has inspired its share of chroniclers. Perhaps Graeme Wood said it best when he wrote in The New Republic in 2012 that “the Old City of Damascus has all the romance of the Old City of Jerusalem, with about a tenth the tourist traps and a seventh the eschatology.” During the preservation boom, tourists were attracted by the conversions of restored Ottoman-era courtyard houses into boutique hotels and restaurants, undertaken by private developers and international agencies. The effort garnered upbeat international press, and Assad presented himself to the world as the custodian of Syrian heritage and history. Maktab Anbar is one of the Old City’s largest mansions; a wealthy Jewish merchant, Yusuf Anbar, bankrupted himself to build it in the 1880s. The local Ottoman authorities assumed control from Anbar and turned the building into a prestigious boys’ school that educated generations of elite Damascene sons. After Syrian independence in 1946, the place fell into disrepair, like many houses and mansions in the Old City. In the 1980s, during the rule of Hafez al-Assad, Bashar’s father, the Syrian Ministry of Culture restored it. By the 2000s, the government had made Maktab Anbar into the headquarters of the various architects—Syrian and foreign, government-backed and from nongovernmental organizations—who oversaw and regulated the dozens of restoration projects bringing new life and money into the Old City. Many restorations were done hastily, with preservation principles ignored in order to turn a quick profit. As with many government-sanctioned cultural projects elsewhere in the Middle East, particularly Egypt, concrete was the material of choice, used to repair the cracks in old wood-and-mud-brick frames or to replace them altogether. The style of most developers, Zabita said, owed much to Syrian soap operas, many of which were set in grand Old City houses with a pastiche of Orientalist styles. The government loved it. The tourism boom tied to restoring Damascus’s old houses coincided with a round of crony economic “reforms” that privatized banks and businesses, mostly for the benefit of Assad’s allies, like his cousin Rami Makhlouf, who seemed to own everything new and profitable in Syria, from a telecom company to duty-free shops and hospitality businesses. Things were looking up, for some, and the regime was on a roll. Four times as many tourists visited Syria in 2010 as had in 2005. As more and more historic houses were repurposed as restaurants and hotels, each courtyard seemingly more idyllic than the next, and the view of Assad’s Syria softened, at least in the international-travel and style sections. There were lengthy, glossy spreads in British Vogue (“The Road to Damascus,” with an English model wandering the old markets, posing in courtyards and keeping a diary) and Condé Nast Traveler (“Dawn in Damascus,” which noted how “the Syrian capital is celebrating a cultural and economic rebirth—despite authoritarian rule”). In Aleppo, in the summer of 2009, I met Christian Louboutin, the French shoe designer; Assad’s wife Asma was known to be a fan. Louboutin had just bought two sprawling, ramshackle eleventh-century houses and had big restoration plans. For al-Azm, there was no sense of shared ownership at play, since on “just about every single major public monument, on the outside, on the facade, there’s a big picture of Assad.” It’s not for nothing that when you enter Syria by land, you’re greeted by a billboard welcoming you to “Assad’s Syria.” That iconography reflects more than a cult of dictatorship; it proclaims that the Assad family and Syria’s cultural heritage must be seen as one and the same. In May, in an area adjacent to Aleppo’s Citadel, Syrian rebels from the Islamic Front blew up the Carleton Hotel, which had been converted from a nineteenth-century hospital. The Syrian army was using the luxury hotel as a base; the Islamic Front claimed that it killed fifty soldiers in the attack. The Citadel itself, including its mighty Mamluk door, has been damaged in rebel attacks, as well as by government shelling. Some of the worst attacks on heritage sites have come from the brutal jihadist groups that have gravitated to the chaos, most of all the Islamic State (formerly known as the Islamic State of Iraq and Syria, or ISIS), which has managed to alienate even the Al Qaeda affiliate in Syria, Jabhat al-Nusra. Both groups have reportedly desecrated churches in eastern Syria, along with statues of early Islamic leaders like the Abbasid Caliph Harun al-Rashid and even a medieval Syrian poet. In January, IS fighters blew up a Byzantine mosaic near the city of Raqqa, east of Aleppo, the first of Syria’s provincial capitals to fall into rebel hands. The Islamic State took over Raqqa from the Free Syrian Army last year and has made the city into its stronghold and self-declared capital; in May, IS fighters there used a German-made Hydrema bulldozer to smash two ancient statues of Assyrian lions from the eighth century BCE. Emma Cunliffe is an English researcher who had used satellite images before the war to monitor the damage done to archaeological sites—“through farming, what have you”—in Syria. The war has given that research new meaning and importance, and Cunliffe has worked with a number of international groups to document the damage done by artillery barrages—as well as the growing international effort to keep a record of what is being lost. There are currently at least thirty-eight groups inside and outside Syria monitoring and raising awareness about the costs of the war, not only to the Syrian people but also to its heritage. The group includes established organizations like the Boston-based American Institute of Archeology; Facebook pages by expatriate Syrians, like “Le patrimoine archéologique syrien en danger” and “Eyes to Protect Syrian Heritage”; and activist networks on the ground, like the Syrian Association for Preserving Heritage and Ancient Landmarks, in Aleppo, and the shadow ministry of culture for the Syrian National Council, based in Turkey. But at the top of the list is the Syrian government’s own Directorate General of Antiquities and Monuments (DGAM), which has been extensively documenting the damage even as the Syrian military destroys the sites. It’s delicate work in the middle of a civil war. “Rather than ascribe blame, they seem to just be reporting the damage,” said Ackerman from the World Monuments Fund. DGAM general director Maamoun Abdulkarim “has gone to extraordinary lengths to follow the procedures for notifying ICOMOS [the International Council on Monuments and Sites] and UNESCO,” she added, issuing frequent reports on confirmed damage and keeping a dedicated staff together and coordinated—just the opposite of what happened in Iraq after the American-led invasion in 2003. The work is also dangerous. 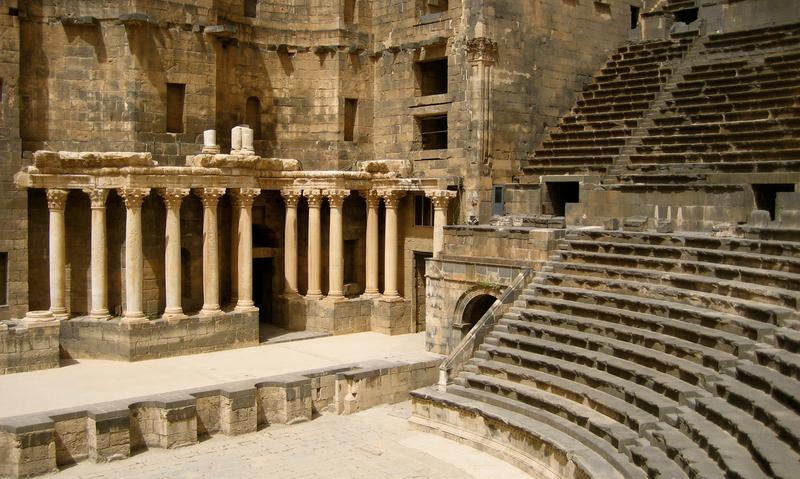 In May, a DGAM employee was killed by a sniper in Bosra, a World Heritage Site twenty-five miles east of Daraa that was once the capital of the Roman province of Arabia. Months earlier, looters shot a guard at Bosra’s second-century Roman theater—the largest and best-preserved one in the Middle East—when he refused to leave his post. Tell Sheikh Hamad (Dur Katlimmu)—Assyrian temple collapsed after shell fire and the site was “transformed into a battlefield between deserters and army”… Mosque of Idlib Sermin (Fatimid era)… Mosque of al-Tekkiyeh Ariha—minaret destroyed… Al-Qusaayr—Great Mosque and Mar Elias monastery damaged… Mosque al-Herak in the Dara’a region… Oldest mosque in city of Sermin… Our Lady of Seydnaya Monastery—Earliest part of monastery dates to early Christian era (circa 547 AD)—shell through back wall… Tomb of the Sheikh Dahur al-Muhammad in Rityan, in Aleppo province… Large parts of Homs, including the ancient citadel… Large parts of Hama, including the ancient citadel… (Unspecified) sites and monuments of the province of Dara’a, especially in the cities of Inkhil, Da’il, and Dar al-Balad. During the last three years, I’ve thought often of Naim Zabita’s challenge to keep thinking of Damascus as a living city. The impediment isn’t overcoming the dissonance between an architect advocating careful, measured urban revitalizations in Damascus five years ago and Syrian troops burning buildings for Assad or dropping barrel bombs on Aleppo today; rather, it’s in thinking that Syria’s cities are still alive. In January, Human Rights Watch released high-resolution satellite images showing how the regime has deliberately razed whole residential neighborhoods in Damascus and Hama, using explosives and bulldozers, as punishment for their apparent support for the rebels. Aleppo is Syria’s Dresden. In June, the regime tightened its grip on the city by leveling rebel-held areas with barrel bombs. The philosophy, it seems, is that the regime won’t have any opponents if it kills them all, and that Aleppo will be a united city again if its rebellious neighborhoods are pulverized. “We are in hell. Just go outside—the city is flattened,” a Syrian-born British citizen told a CNN reporter from a hospital bed. In his office in Maktab Anbar, Zabita had made his case for a living city in architecture. “Everything here was built around traditions: the family, its habits, the habits between neighbors. And all of this has affected the architecture itself. There were small details that were used in architecture to indicate something beyond architecture—to indicate property lines, or to indicate use.” He was making a point about the rich details of the Old City’s celebrated courtyard houses, details that were lost in careless restorations and, it seemed to me, an empty valorization of Old Damascus as a kind of national slogan for Bashar’s new Syria: same as the old, but more chic and prosperous for a few.